In my latest offering ‘The Asterisk: A Fan’s Grievance On Cheating And Rule Manipulation In The NFL,’© I seek to dismantle the mental construct of how one views great athletic pursuits in the National Football League (NFL). The NFL has spent decades implementing rules to minimize great athletic performance on the field of play and my book chronicles athletes challenging the system and media entities like Slate Magazine and The New York Times reporting on the phenomenon. So, we celebrate based on the satisfaction of points on the board. We celebrate whether the points are artificial or real. This is the outcome that Roger Goodell would like to see. There are many varieties of bottled water and for many consumers, consumption is based on the satisfaction of taste alone and not on the genuine purification standards, or in the NFL’s case superior athletic standards. 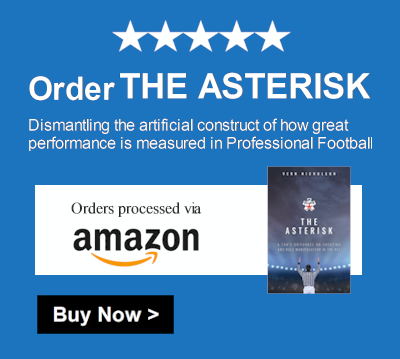 ‘The Asterisk’ seeks to call attention to the NFL’s affirmative action to implement an artificial standard of excellence in the NFL. Many fans have expressed disappointment of the litany of rule changes, put in place ostensibly for the profitability of the league. There is no question that the league has the ultimate authority to implement their own rules, but fans have the ability to express their angst. Instead of using a scalpel and changing rules when they are absolutely necessary, the NFL continues to use a hatchet when it is motivated by greed and not the interest of the wholesome excitement of Professional Football. Fan’s will not affect change by tiptoeing around the issue. What is at stake is the integrity of a great sport, which is skirting the line between legitimate sport and an entertainment spectacle.